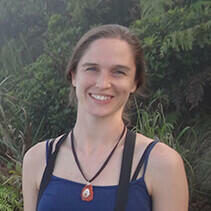 Dr. Sarah Faegre serves San Diego Zoo Global as a Research Associate in Recovery Ecology. In this role, her primary responsibilities include assisting with the development and implementation of a rear-and-release program for the critically endangered aga, or Mariana crow, on Rota in the Northern Mariana Islands. Sarah’s current projects include behavioral studies of captive aga, monitoring the release of captive-reared aga, and conducting education and outreach activities for local children. Sarah has worked with the aga on Rota since 2009, studying foraging ecology, habitat use, and spatial movements. Sarah specializes in behavioral research and conservation of parrots and corvids. She is particularly interested in the comparative studies of foraging and social behavior in wild and captive-reared individuals. Prior to her work with the aga, Sarah spent four years working with endangered parrots in Argentina and Bolivia. She has also worked with passerines, raptors, and seabirds at avian monitoring and banding stations in the western United States and Ontario, Canada. She has a passion for climbing trees and especially enjoys using her tree-climbing skills to access bird nests. Sarah earned her bachelor’s degree in Biology and Animal Behavior from Hampshire College, and her master’s degree in Animal Behavior from the University of Washington. She received an NSF Graduate Research Fellowship for her doctoral studies, earning her doctorate in Behavioral Ecology of the aga in 2017 from the University of Washington.